Political Voice - Is a massive scandal is brewing at the FBI? Is a massive scandal is brewing at the FBI? Topic: Is a massive scandal is brewing at the FBI? Subject: Is a massive scandal is brewing at the FBI? Yet each day brings credible reports suggesting there is a massive scandal involving the top ranks of America’s premier law enforcement agency. The reports, which feature talk among agents of a “secret society” and suddenly missing text messages, point to the existence both of a cabal dedicated to defeating Donald Trump in 2016 and of a plan to let Hillary Clinton skate free in the classified email probe. If either one is true — and I believe both probably are — it would mean FBI leaders betrayed the nation by abusing their powers in a bid to pick the president. More support for this view involves the FBI’s use of the Russian dossier on Trump that was paid for by the Clinton campaign and the Democratic National Committee. It is almost certain that the FBI used the dossier to get FISA court warrants to spy on Trump associates, meaning it used the opposition research of the party in power to convince a court to let it spy on the candidate of the other party — likely without telling the court of the dossier’s political link. Even worse, there is growing reason to believe someone in President Barack Obama’s administration turned over classified information about Trump to the Clinton campaign. As one former federal prosecutor put it, “It doesn’t get worse than that.” That prosecutor, Joseph ­diGenova, believes Trump was correct when he claimed Obama aides wiretapped his phones at Trump Tower. These and other elements combine to make a toxic brew that smells to high heaven, but most Americans don’t know much about it. Mainstream media coverage has been sparse and dismissive and there’s a blackout from the same Democrats obsessed with Russia, Russia, Russia. Partisan motives aside, it’s as if a scandal of this magnitude is more than America can bear — so let’s pretend there’s nothing to see and move along. But, thankfully, the disgraceful episode won’t be washed away, thanks to a handful of congressional Republicans, led by California Rep. Devin Nunes, chairman of the House Permanent Select Committee on Intelligence. After he accused the FBI of stonewalling in turning over records, the bureau relented, at least partially. The result was clear evidence of bias against Trump by officials charged with investigating him and Clinton. Those same agents appear to have acted on that bias to tilt the election to Clinton. In one text message, an agent suggests that Attorney General Loretta Lynch knew while the investigation was still going on that the FBI would not recommend charges against Clinton. How could she know unless the fix was in? All roads in the explosive developments lead to James Comey, whose Boy Scout image belied a sinister belief that he, like his infamous predecessor J. Edgar Hoover, was above the law. It is why I named him J. Edgar Comey last year and wrote that he was “adept at using innuendo and leaks” to let everybody in Washington know they could be the next to be investigated. It was in the office of Comey’s top deputy, Andrew McCabe, where agents discussed an “insurance policy” in the event that Trump won. Reports indicated that the Russia collusion probe was that insurance policy. The text was from Peter Strzok, the top investigator on the Trump case, and was sent to Lisa Page, an FBI lawyer and also his mistress. It is frightening that Strzok, who called Trump “an idiot,” was the lead investigator on both the Clinton and Trump cases. After these messages surfaced, special counsel Robert Mueller removed Strzok and Page from his probe, though both still work at the FBI. Talk about irony. While Dems and the left-wing media already found Trump guilty of collusion before Mueller was appointed, the real scandal might be the conduct of the probers themselves. Suspicions are hardly allayed by the fact that the FBI says it can’t find five months of messages between Strzok and Page, who exchanged an estimated 50,000 messages overall. The missing period — Dec. 14, 2016, through May 17, 2017 — was a crucial time in Washington. There were numerous leaks of classified material just before and after Trump’s inauguration on Jan. 20. And the president fired Comey last May 9, provoking an intense lobbying effort for a special counsel, which led to Mueller’s appointment on May 19. Jeff Sessions, the attorney general, has emerged from his hidey hole to notice that the FBI has run amok, and said Monday he would “leave no stone unturned” to find the five months of missing texts. Fine, but the House is racing ahead of him. Nunes has prepared a four-page memo, based on classified material that purportedly lays out what the FBI and others did to corrupt the election. A movement to release the memo is gaining steam, but Congress says it might take weeks. Why wait? Americans can handle the truth, no matter how big it is. Hmmm... the plot thickens. Trump fires Comey, Trump fires McCabe and Trump wants to fire Rosenstein and Mueller. Do you think this has anything to do with the Mueller investigation? Nunes has made a conspiracy charge? Instead of March madness, this is turning out to be February madness. When you post something that is untrue, how can I take the rest of your post seriously? McCabe was not fired by Trump. FBI Director Christopher Wray was allegedly "shocked to his core" after viewing the four-page FISA memo Sunday night - hours before asking Deputy FBI Director Andrew McCabe to step down, according to journalist Sara Carter. Carter: What we know tonight is that FBI Director Christopher Wray went Sunday and reviewed the four-page FISA memo. The very next day, Andrew McCabe was asked to resign. Remember Sean, he was planning on resigning in March - that already came out in December. This time they asked him to go right away. You're not coming into the office. I've heard rep[orts he didn't even come in for the morning meeting - that he didn't show up. Hannity: A source of mine told me tonight that when Wray read this, it shocked him to his core. Sara Carter: Shocked him to his core, and not only that, the Inspector General's report - I have been told tonight by a number of sources, there are indicators right now that McCabe may have asked FBI agents to actually change their 302's - those are their interviews with witnesses. So basically every time an FBI agent interviews a witness, they have to go back and file a report. Hannity: Changes? So that would be obstruction of justice? Carter: Exactly. This is something the Inspector General is investigating. If this is true and not alleged, McCabe will be fired. I heard they are considering firing him within the next few days if this turns out to be true. Carter said that McCabe "quitting" is just the beginning and that more resignations will be coming. As we reported yesterday, McCabe was "removed" from his post as deputy director, "leaving the bureau after months of conflict-of-interest complaints from Republicans including President Trump." Several media outlets reported that McCabe is using his remaining vacation days to go on "terminal leave" and that his official retirement from the agency won't happen until March, allowing him to collect the full pension. And as we noted last week, FBI Director Wray threatened to resign after being pressured by AG Jeff Sessions. Around the time of the reports of his impending retirement, McCabe had spent several marathon sessions answering questions from Congressional committees behind closed doors. It was expected that McCabe would hang on until early March when he would become eligible for his full pension. It's unclear why he's choosing to step down early. McCabe's accelerated resignation may a sign that Trump appointee Christopher Wray - who succeeded James Comey as FBI Director - is finally cleaning house. According to Axios, McCabe may be leaving in anticipation of the release of an inspector general's report on how the FBI handled the Clinton email investigation. My information came from the Business Insider, a reputable firm. A CNN producer and a Fox News reporter did say that McCabe was told Monday morning to step down, AND that he was being “removed” from the FBI. That’s fired in my book. You said Trump fired him. How do you go from someone asked him to step down to Trump fired him? Well, I read the “earth-shattering, put-Watergate-on-the-back-burner Nunes memo. Is Nunes holding back information? All that I have been able to discern of the most damning news on our American Intelligence agencies is that someone may have not followed proper protocol. What am I missing? Most of the world probably assumes this is merely an attempt to stop Mueller’s investigation.There is a possibility that Mueller will find nothing. Why would an innocent person try to stop an investigation that could prove his innocence? I never cared much for Shakespeare, but to paraphrase...” he does protest too much”. Trump has brought Charles Bukowski’s Dinosauria, We. Into 2018. But part of me thinks. Independent of Bannon and Gorka Mr. Trump will destroy both the GOP and the Democrats. He has uncovered the joke of the religious right but had to expose the hypocrisy of the Left to do so. And those same people who think that someone who Franklin Graham backs him as ‘one of them’ will fall victim to the Billionare. May be our entire nation falls victim to our Reality Show Host in Chief. Here’s what happened last week behind the smokescreen of the Nunes memo. Don held off on new Russian sanctions, despite the law. The stock market lost 2.5%, worrries about inflation and the Feds raising interest rates. The bond market is up 2.85%. The feds will have to borrow almost $1 trillion this fiscal year (an 84% increase from last fiscal year) due to the lower level of tax revenue that the government will reap under the new tax law. In addition, Don wants $25 billion for a Mexican wall and even more $ for the military. I’m wondering: how is this going to pan out? The cherry on the top....somehow Don will address our infrastructure issues. The case of the FBI and Christopher Steele gets curiouser and curiouser. In the latest news, GOP Senators Chuck Grassley and Lindsey Graham late Tuesday released a less redacted version of their criminal referral letter to the Justice Department concerning Mr. Steele, who wrote the now famous dossier alleging Russian collusion with Donald Trump. The letter supports the recent House Intelligence Committee claims of surveillance abuse and offers new evidence that the Clinton campaign may have been more involved than previously known. Democrats claim the House Intel memo distorts the FBI’s actions in obtaining in October 2016 an order from the Foreign Intelligence Surveillance Court to monitor former Trump aide Carter Page. But the Grassley-Graham referral makes public for the first time actual text from the FBI’s FISA application, as well as classified testimony the FBI gave the Senate Judiciary Committee about the dossier and FISA application. In particular, the referral rebuts the Democratic claim that the FBI told the FISA court about the partisan nature of the Steele dossier. “The FBI noted to a vaguely limited extent the political origins of the dossier,” says the letter. And “the FBI stated that the dossier information was compiled pursuant to the direction of a law firm who had hired an ‘identified U.S. person’—now known as Glenn Simpson of Fusion GPS,” the firm that hired Mr. Steele. But, adds the referral letter, “the application failed to disclose that the identities of Mr. Simpson’s ultimate clients were the Clinton campaign and the DNC [Democratic National Committee].” That’s not being honest with the judges who sign off on an eavesdrop order. In other words, the FBI rested its wiretap application on the credibility of a source who was working at the direction of the Clinton campaign. The FBI also seems to have closed its eyes to evidence that Mr. Steele wasn’t honest. The FBI acknowledges that it told Mr. Steele not to speak to the media about the dossier. Yet in September 2016 the ex-British spy briefed reporters about the FBI’s investigation and the dossier, which resulted in the Yahoo News article. The Clinton campaign cited that article on TV and social media to attack the Trump campaign. This was about a month prior to the FBI filing its first FISA application. Yet the FBI’s October application told the FISA court that, “The FBI does not believe that [Steele] directly provided this information to the press.” Whether Mr. Steele lied to the FBI, or the FBI was too incompetent to verify that he was the source of the Yahoo News story, the result is the same: The FISA court issued a surveillance order on the basis of false information about the credibility of the FBI’s main source. Even after Mr. Steele said under oath in court filings in London that he had briefed Yahoo News, and this fact was reported by U.S. media in April 2017, the FBI didn’t tell the FISA court in any subsequent wiretap application. The Grassley-Graham referral also drops the stunning news that Mr. Steele received at least some of the information for his dossier from the Obama State Department. The letter redacts the names involved. But the press is now reporting, and our sources confirm, that one of the generators of this information was none other than Sidney Blumenthal. GOP Rep. Trey Gowdy, who has seen the documents, told Fox News “that would be really warm” when asked if Mr. Blumenthal is one of the redacted names. Mr. Blumenthal has declined comment to several media outlets. But our readers will recall that he is a long-time Hillary Clinton operative whom President Obama barred from an official role at State but was later discovered to have sent her policy and political advice via her private email server. This revelation raises questions about the degree to which the Clinton team was involved in the Steele-Fusion effort from the beginning. Some of our media friends are so invested in the Steele dossier, or in protecting their Fusion pals, or in Donald Trump’s perfidy, that they want to ignore all this. But journalists ought to tell the complete story. The best way to learn what’s true and false in the Russian influence story is radical transparency, and the Trump Administration should declassify all four FISA applications on Mr. Page and all of the documents behind them. Meanwhile, thanks to the two Senators for helping get closer to the truth. Well,well....surprise,surprise! Don blocks the release of a Democratic memo on the Russian investigation. 1. Love it when you call him Don. Like The Don. So Mafioso. 2. Get informed about the Democrat memo because you are only speaking the Democrat talking points. You know there is more to it. Plus it's a trap. Informed? Do you have the inside scoop on the Democratic memo? Please share! Nunes has set precedent by being the first to release this confidential memo against the wishes of the FBI and the Justice Department. In the future, how likely are our allies to share information? This is dangerous ground. From the "Horses" Mouths" : Democrat House Committee Memo poses risk to National Security. Did we see that from FBI and DOJ re: House Republican committee Memo....NO!!! As I heard someone say, prior to Democrats' memo release "Democrats are smart enough to include information in their memo that CANNOT be released due to intelligence issues" so that they will be able to yap, yap, yap about release of Republican memo (no security problem info - re FBI, DOJ) vs no release of Democrat memo ( FBI and DOJ specifically said Dems' memo poses risk to National Security)!!! Please attach the source of your post. Otherwise it looks very suspect. It’s nearly unintelligible what you wrote. Why was the FBI helping the Democratic Party by using its unverified paid research? Why not confirm Steele's Carter Page entries first using all the bureau's power and then present info to FISA judge? Instead, FBI "verified" by relying on Yahoo News story (same source) four times. Why hasn't Rosenstein recused himself? He signed a bogus FISA warrant, so he's now a potential witness in any REAL Russian collusion case. The Watergate scandal of 1972-74 was uncovered largely because of outraged Democratic politicians and a bulldog media. They both claimed that they had saved American democracy from the Nixon administration's attempt to warp the CIA and FBI to cover up an otherwise minor, though illegal, political break-in. In the Iran-Contra affair of 1985-87, the media and liberal activists uncovered wrongdoing by some rogue members of the Reagan government. They warned of government overreach and of using the "Deep State" to subvert the law for political purposes. We are now in the midst of a third great modern scandal. Members of the Obama administration's Department of Justice sought court approval for the surveillance of Carter Page, allegedly for colluding with Russian interests, and extended the surveillance three times. Nor did officials add that a Department of Justice official, Bruce Ohr, had met privately with Steele -- or that Ohr's wife, Nellie, had been hired to work on the dossier. Members of the Obama administration's national security team also may have requested the names of American citizens connected with the Trump campaign who had been swept up in other FISA surveillance. Those officials may have then improperly unmasked the names and leaked them to a compliant press -- again, for apparent political purposes during a campaign. As a result of various controversies, the deputy director of the FBI, Andrew McCabe, has resigned. Two FBI officials who had been working on special counsel Robert Mueller's team in the so-called Russia collusion probe, Lisa Page and Peter Strzok, have been reassigned for having an improper relationship and for displaying overt political biases in text messages to each other. The new FBI director, Christopher Wray, has also reassigned the FBI's top lawyer, James Baker, who purportedly leaked the Steele dossier to a sympathetic journalist. How does FISA-gate compare to Watergate and Iran-Contra? Once again, an administration is being accused of politicizing government agencies to further agendas, this time apparently to gain an advantage for Hillary Clinton in the run-up to an election. There is also the same sort of government resistance to releasing documents under the pretext of "national security." There is a similar pattern of slandering congressional investigators and whistleblowers as disloyal and even treasonous. There is the rationale that just as the Watergate break-in was a two-bit affair, Carter Page was a nobody. But there is one huge (and ironic) difference. In the current FISA-gate scandal, most of the media and liberal civil libertarians are now opposing the disclosure of public documents. They are siding with those in the government who disingenuously sought surveillance to facilitate the efforts of a political campaign. This time around, the press is not after a hated Nixon administration. Civil libertarians are not demanding accountability from a conservative Reagan team. Instead, the roles are reversed. Barack Obama was a progressive constitutional lawyer who expressed distrust of the secretive "Deep State." Yet his administration weaponized the IRS and surveilled Associated Press communications and a Fox News journalist for reporting unfavorable news based on supposed leaks. Obama did not fit the past stereotypes of right-wing authoritarians subverting the Department of Justice and its agencies. Perhaps that is why there was little pushback against his administration's efforts to assist the campaign of his likely replacement, fellow Democrat Hillary Clinton. Progressives are not supposed to destroy requested emails, "acid wash" hard drives, spread unverified and paid-for opposition research among government agencies, or use the DOJ and FBI to obtain warrants to snoop on the communications of American citizens. FISA-gate may become a more worrisome scandal than either Watergate or Iran-Contra. Why? Because our defense against government wrongdoing -- the press -- is defending such actions, not uncovering them. Liberal and progressive voices are excusing, not airing, the excesses of the DOJ and FBI. Apparently, weaponizing government agencies to stop a detested Donald Trump by any means necessary is not really considered a crime. It strikes us as odd that, among your activities in the final moments on the final day of the Obama administration, you would feel the need to send yourself such an unusual email purporting to document a conversation involving President Obama and his interactions with the FBI regarding the Trump/Russia investigation. In addition, despite your claim that President Obama repeatedly told Mr. Corney to proceed "by the book," substantial questions have arisen about whether officials at the FBI, as well as at the Justice Department and the State Department, actually did proceed "by the book." Department of Justice Inspector General (DOJ-IG) Michael Horowitz’s long-awaited report will accuse outgoing FBI Deputy Director Andrew McCabe of improper leaking to the press and deliberately misleading DOJ-IG investigators, according to Thursday reporting in the New York Times and Washington Post. Jeez, John Beagle, the Nunes memo is so last week... I’m exasperated trying to keep up with current news and Don’s tweets! It’s twenty four hours a day. Jared and Ivanka may be asked to leave the White House! Steel and aluminum tariffs are coming! Don’s flip-flopping with the NRA! The attack (again) on “Alex” Baldwin! The price of my aluminum beer cans to go up! Putin’s threats to annihilate Mar Lago, and Don’s “no tweet-no answer-not even a nickname” response for Putin! Not only that, but I forgot the continuing Mueller investigation! What Has Happened To The FBI? The reputation of the FBI is sinking, and it is sinking fast. The new revelations that seem to come out every day are not just embarrassing, but increasingly serious and dangerous. With the sometimes sketchy history of the Federal law enforcement agencies, especially the FBI; why have we been so explicit in our praise? Is it really just a few bad apples at the top or is there something more systematic? There has been quite a few mishaps and flat-out abuses of power over their history. A thorough house cleaning and transparency is definitely in order. The FBI was formed in 1908 under the name Bureau of Investigation. In 1924 the most famous FBI director in history, Herbert Hoover, took over running the agency at the age of 24. In 1935 the bureau was renamed the Federal Bureau of Investigation, the FBI. J. Edgar Hoover led the agency for over 40 years. During this time illegal wiretapping and other actions against Civil Rights leaders and private citizens were rampant. The most famous and biggest files were Eleanor Roosevelt and Martin Luther King. The constitutional abuses against the citizens it was supposed to be protecting was widespread and when revealed, extremely embarrassing and troubling. In 1992 the FBI was one of the Federal agencies that surrounded a remote cabin in Idaho, which was occupied by the Weaver family. They believed Randy Weaver to have violated federal gun laws. Whether he was set up or in violation of any laws is still in dispute. Afterward, when the dust settled, Weaver's wife, Vicki and 14-year-old son Sam were dead. So was a Deputy US Marshal. Eventually, the Weaver family would sue the government and win over $3 million in court. The actions and conduct of the Feds were highly criticized. Barely a year later in 1993, the FBI was at it again in Waco Texas, with alleged firearm violations against a group called the Branch Davidians, a 7th-day Adventist offshoot. The compound in Waco was filled with men, women, and children. Like Before, when the dust cleared 76 people were dead, and the compound was burned to the ground. Four federal agents were also dead. Once again the federal agencies were heavily criticized and sued. In another case of Federal malfeasance, the FBI leaked intel and ruined the life of security guard Richard Jewell over the 1996 Olympic Park bombing in Atlanta. Although Jewell found the pipe bomb and helped evacuate people, undoubtedly saving lives, he became the subject of surveillance and investigation. Some of this was leaked to the media causing mass scrutiny of his life. Although he was eventually cleared and won some libel lawsuits against the media, his life was never the same. He died at the age of 44, a forgotten hero who had been treated horribly by the FBI and media. A less well-known FBI miscalculation and mistake was the decades it used a special bullet analysis system to trace bullets, supposedly down to a specific box of ammo. The National Academy of Science eventually proved this to be false, and the FBI stopped using this method, but it took decades, and the amount and extent of cases tainted are still unknown. The most egregious and deadly of the FBI’s failures was missing the terrorist attacks on September 11, 2001. While it was not the FBI alone, they did miss or discount the many warnings about the possibilities of plane attacks and large groups of Middle Eastern men taking flying lessons. Taking off was an important topic, but the landing was not. Apparently, this was not a red flag for the FBI. Then of course in 2013 the Tsarnaev brothers bombed the Boston Marathon, killing three civilians as well as a police officer three days later. A prior FBI interview with the Tsarnaev's and warnings from the Russian government was not enough for the FBI to act. The recent Dismissal of the case against the Bundy family concerning grazing rights and Federal land in Nevada is just another example of the Feds (and politicians) gone wild. Withholding information and lying about FBI snipers and surveillance caused the judge to dismiss the case “with prejudice.” Once again lawsuits are in the making. The mass murder in parkland Florida is unfortunately just the latest in government policy and action failure. This is, of course, a still-developing situation, but with every new revelation, the government is looking increasingly bad and inept. This horrific mass murder seems to fall mostly on the failure of local and state authorities, but once again the FBI is involved and appears to have failed the very people it was supposed to protect. We will have to see how this plays out. Nobody should dispute that the FBI has done amazing things in fighting crime, spies and protecting this country. They have done amazing things with criminal investigation procedures and tactics that they invented or perfected. However, is it just a handful of people at the top or is it a bigger problem? The FBI is entrusted with enormous power over the citizens of this country, but it seems there is a huge problem of accountability, transparency, and oversight. This is an immediate and dangerous problem. It needs to be addressed by serious people, with the public being made aware of everything. They do work for us after all. House Intelligence Committee Chairman Devin Nunes threatened FBI Director Christopher Wray and Deputy Attorney General Rod Rosenstein with contempt of Congress and impeachment if they fail to turn over unredacted documents requested by congressional investigators. Fox News host Laura Ingraham challenged Nunes Tuesday evening to take action, citing the fact that Eric Holder had been held in contempt for covering up the release of documents pertaining to the Fast and Furious scandal. Nunes explained that investigators issued a subpoena for unredacted documents pertaining to the FBI’s justification to pursue a Trump/Russia collusion investigation back in August. “We’re at a boiling point where we need this two-page document,” he demanded seven months later. He seems closer to that conclusion. Many view Trump’s attacks as self-serving: he has called the renowned agency an “embarrassment to our country” and its investigations of his business and political dealings a “witch hunt.” But as much as the bureau’s roughly 14,000 special agents might like to tune out the news, internal and external reports have found lapses throughout the agency, and longtime observers, looking past the partisan haze, see a troubling picture: something really is wrong at the FBI. The Justice Department’s Inspector General, Michael Horowitz, will soon release a much-anticipated assessment of Democratic and Republican charges that officials at the FBI interfered in the 2016 presidential campaign. That year-long probe, sources familiar with it tell TIME, is expected to come down particularly hard on former FBI director James Comey, who is currently on a high-profile book tour. It will likely find that Comey breached Justice Department protocols in a July 5, 2016, press conference when he criticized Hillary Clinton for using a private email server as Secretary of State even as he cleared her of any crimes, the sources say. The report is expected to also hit Comey for the way he reopened the Clinton email probe less than two weeks before the election, the sources say. The report closely follows an earlier one in April by Horowitz, which showed that the ousted deputy director of the FBI, Andrew McCabe, had lied to the bureau’s internal investigations branch to cover up a leak he orchestrated about Clinton’s family foundation less than two weeks before the election. (The case has since been referred to the U.S. Attorney’s office in Washington, D.C., for potential prosecution.) Another IG report in March found that FBI retaliation against internal whistle-blowers was continuing despite years of bureau pledges to fix the problem. Last fall, Horowitz found that the FBI wasn’t adequately investigating “high-risk” employees who failed polygraph tests. There have been other painful, more public failures as well: missed opportunities to prevent mass shootings that go beyond the much-publicized overlooked warnings in the Parkland, Fla., school killings; an anguishing delay in the sexual-molestation probe into Olympic gymnastics doctor Larry Nassar; and evidence of misconduct by agents in the aftermath of standoffs with armed militias in Nevada and Oregon. FBI agents are facing criminal charges ranging from obstruction to leaking classified material. And then there’s potentially the widest-reaching failure of all: the FBI’s miss of the Russian influence operation against the 2016 election, which went largely undetected for more than two years. At this point, there is little doubt that the highest echelons of the FBI and the Justice Department broke their own rules to end the Hillary Clinton “matter,” but we can expect the inspector general to document what was done or, more pointedly, not done. It is hard to see how a yearlong investigation of this won’t come down hard on former FBI Director James Comey and perhaps even former Attorney General Loretta Lynch, who definitely wasn’t playing mahjong in a secret “no aides allowed” meeting with former President Clinton on a Phoenix airport tarmac. This process must now be stopped, preferably long before a vote in the Senate. Rather than a fair, limited and impartial investigation, the Mueller investigation became a partisan, open-ended inquisition that, by its precedent, is a threat to all those who ever want to participate in a national campaign or an administration again. Its prosecutions have all been principally to pressure witnesses with unrelated charges and threats to family, or just for a public relations effect, like the indictment of Russian internet trolls. Unfortunately, just like the Doomsday Machine in “Dr. Strangelove” that was supposed to save the world but instead destroys it, the Mueller investigation comes with no “off” switch: You can’t fire Mueller. He needs to be defeated, like Ken Starr, the independent counsel who investigated President Clinton. Finding the “off” switch will not be easy. Step one here is for the Justice Department inspector general report to knock Comey out of the witness box. Next, the full origins of the investigation and its lack of any real intelligence needs to come out in the open. The attorney general, himself the target of a secret investigation, needs to take back his Justice Department. Sessions needs to act quickly, along with U.S. Attorney John Huber, appointed to conduct an internal review of the FBI, on the Comey and McCabe matters following the inspector general report, and then announce an expanded probe into other abuses of power. The final stopper may be the president himself, offering two hours of testimony, perhaps even televised live from the White House. The last time America became obsessed with Russian influence in America was the McCarthy hearings in the 1950s. Those ended only when Sen. Joseph McCarthy (R-Wis.) attacked an associate of the U.S. Army counsel, Joseph Welch, and Welch famously responded: “Sir, have you no decency?” In this case, virtually every associate and family member of the president has been subject to smears conveniently leaked to the press. Stopping Mueller isn’t about one president or one party. It’s about all presidents and all parties. It’s about cleaning out and reforming the deep state so that our intelligence operations are never used against opposing campaigns without the firmest of evidence. It’s about letting people work for campaigns and administrations without needing legal defense funds. It’s about relying on our elections to decide our differences. Mark Penn served as pollster and adviser to President Clinton from 1995 to 2000, including during his impeachment. He is chairman of the Harris Poll and author of “Microtrends Squared.” Follow him on Twitter @Mark_Penn. Where in the World Was Barack Obama? Somehow the former commander-in-chief is largely absent from the political spying drama. President Donald Trump tweets today: “Reports are there was indeed at least one FBI representative implanted, for political purposes, into my campaign for president. It took place very early on, and long before the phony Russia Hoax became a ‘hot’ Fake News story. If true - all time biggest political scandal!” And what does the man who was serving at the time as the FBI’s ultimate boss have to say about all this? Perhaps it’s a good moment to get the whole story from our 44th President. He should now have time to discuss his administration’s surveillance of affiliates of a presidential campaign because he has just prevailed in a contentious dispute. Construction of the Obama Presidential Center in Chicago took a major step forward Thursday with a city commission’s decision to sign off on the project after hours of testimony from both supporters and opponents of the project. The Chicago Plan Commission unanimously approved a proposal to build former President Barack Obama’s center in Jackson Park on the city’s South Side. The action came over protests from opponents who want an agreement that local residents will benefit from the $500 million project. However, Obama Presidential Center supporters cheered the plans for the presidential center, saying it would bring job opportunities to the area and foster economic development. Since his name is on the door, there really was no way for Mr. Obama to avoid being at the center of this story. But in a somewhat larger story he has remained largely—and strangely—absent. Mr. Trump was referring to what he deems a deep-state conspiracy to get him. His detractors are referring to the various scandals swirling around Mr. Trump. Watergate has long been the touchstone for modern American scandal, the mountain of misconduct against which all others are judged. In the 44 years since Richard M. Nixon resigned, virtually every political investigation has been likened to the one that brought down a president, the suffix “gate” applied to all sorts of public flaps, no matter how significant or trivial. But rarely has the comparison been as intense and persistent as during the 16 months since Mr. Trump took office — a comparison deployed by both sides in hopes of shaping the narrative of wrongdoing. What started out as an inquiry into Russia’s meddling in the 2016 election has mushroomed into questions of perjury, obstruction of justice, conspiracy, abuse of power, illicit spying, hush money, tax fraud, money laundering and influence peddling. Many of those questions remain unanswered but we do know that the “deep state” referenced by the Times did have a boss in 2016. Yet Mr. Obama doesn’t show up in this story until the ninth paragraph. Those inclined toward Watergate analogies will say that it was some time before the break-in was connected to Richard Nixon, and of course we have no idea at this point whether the current controversy will end up being a Trump scandal, an Obama scandal or a permanently murky partisan battleground. By this point it seems clear that Mr. Obama didn’t think much of the theory that Mr. Trump colluded with the Russians. But presumably he learned quite a bit about his government’s efforts to investigate it. It’s not clear what an FBI official meant in 2016 when texting that President Obama “wants to know everything we’re doing.” But we can assume that the President was fairly well-informed about the law enforcement agencies reporting to him. Therefore let’s hear from him in detail the full history of how the government came to investigate the presidential campaign of the party out of power. If he doesn’t know, then it would seem a public explanation is also in order—about his management, and about just how far the “deep state” went without specific presidential approval. It is a fact that the assessments of the CIA, NSA, FBI and ODNI all led to the conclusion that these espionage attacks were from Russia. Secondly, it wasn’t a “spy”; it was an FBI informant assigned to see if Russia was meddling in our election. To me, Trump’s investigation into the investigators is a total WITCH HUNT. I believe that this is just another attempt by Trump and Giuliani to discredit Robert Mueller’s findings in the probe into Russian interference of the 2016 election. Yea, and the FBI had a spy embedded in the Trump campaign for his own good. Right. Beagle, It does seem to me that I am the only respondent to your political posts. Is there no one else with theories or opinions? 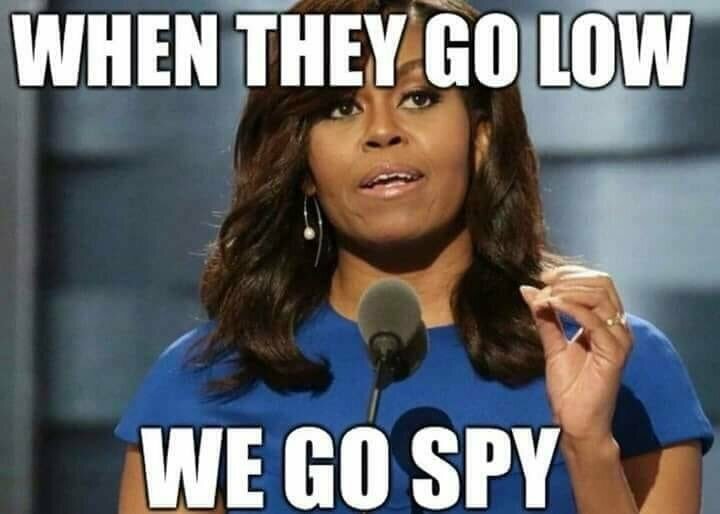 So...did spygate go the way of the birther claim, the Obama wire taps ? Don is a fraud. No one in our government has the temerity to challenge him. No one! A bombshell inspector general report released Thursday revealed that several FBI employees improperly received gifts from reporters, in connection with possible leaks of sensitive information. Has interests that may be substantially affected by performance or nonperformance of the employee’s official duties. These rules apply to government officials, and it is not clear if any reporters involved in these dealings could face any sort of punishment. It’s also not clear a reporter should be considered a “prohibited source” within the meaning of the provided definitions. Violations of gift-giving rules are sometimes prosecuted as violations of the honest services fraud (HSF) statute. High profile office-holders indicted for gift violations under this law include Democratic Sen. Bob Menendez of New Jersey and former GOP Gov. Bob McDonnell of Virginia. Jack Abramoff, the notorious Washington lobbyist, was convicted of honest services fraud. The HSF statute is a controversial tool, as its vague provisions permit an enterprising prosecutor to make a criminal case out of good faith mistakes or generally harmless conduct. The U.S. Supreme Court dramatically narrowed the reach of the law in a 2010 case called Skilling v. U.S., confining its use to cases involving bribes or kickbacks. Violations of federal anti-corruption laws occur when a public employee takes “official action” in exchange for gifts. The high court has confined the meaning of “official action” to include only formal exercises of power in official proceedings. It’s not clear that leaking to a reporter falls within this definition, although other federal laws may criminalize this conduct. Criminal cases notwithstanding, unauthorized media contacts involving the exchange of gifts could serve as a basis for other administrative penalties, like reassignment, suspension or termination. President Trump broke his silence on the scathing inspector general's report with a vengeance Friday, first tweeting that the FBI boss he fired was the "worst" in the bureau's history, then crashing "Fox & Friends" for an impromptu interview where he continued to blister the "scum on top" of the Obama-era bureau. In the interview with Fox's Steve Doocy, Trump made it clear he considered Comey the leader of those "minions." "I think Comey was the ringleader of this whole den of thieves," Trump said. Horowitz's report faulted Comey for going over the heads of his superiors, including former Attorney General Loretta Lynch, by holding a press conference to announce the FBI’s decision not to press criminal charges against Clinton. At that July, 2016 news conference, Comey called the then-presidential candidate's actions “extremely careless,” rather than “grossly negligent,” as drafted in the initial exoneration statement. Critics have suggested that Trump's firing of Comey amounted to obstruction of justice, though Deputy Attorney General wrote a recommendation that Comey be fired. Trump reportedly told Russian officials in May, 2017 that Comey was a "real nutjob," and indicated the firing had to do with "facing great pressure because of Russia," in an apparent reference to Special Counsel Robert Mueller's investigation into alleged collusion between Moscow and the Trump campaign. Trump later denied that his decision to fire Comey was linked to the Russia probe. The IG report also focused on political bias within the bureau—specifically referring to FBI officials Peter Strzok and Lisa Page, who first came under scrutiny in December over a series of politically-charged, anti-Trump text messages they exchanged. The inspector general released new text messages between the two—suggesting that they would “stop” Trump from becoming president. “[Trump’s not ever going to become president, right? Right! ?” Page texted Strzok in August 2016. Trump blasted Strzok early Friday in a separate tweet. “FBI Agent Peter Strzok, who headed the Clinton & Russia investigations, texted his lover Lisa Page, in the IG Report, that ‘we’ll stop’ candidate Trump from becoming President. Doesn’t get any lower than that!” Trump tweeted. The report revealed that more bureau officials than previously thought were exchanging anti-Trump messages. The inspector general referred five FBI employees for further investigation. MYE, or “Midyear Exam,” was the code used in the FBI to refer to the investigation into Clinton’s private email server. “Some of these text messages and instant messages mixed political commentary with discussions about the Midyear investigation, and raised concerns that political bias may have impacted investigative decisions,” the report read. Strzok and Page, who were romantically involved, both served for a short period of time on Special Counsel Robert Mueller’s Russia investigation team. Strzok was reassigned following the revelations of his anti-Trump texts. Page resigned from the bureau last month. But while many of those texts were made public in late 2017, the IG report revealed a new one in which Strzok vowed to "stop" Trump from becoming president -- and made clear that as many as five total FBI employees exchanged politically charged messages. "The text messages and instant messages sent by these employees included statements of hostility toward then candidate Trump and statements of support for candidate Clinton," the report said. "I don’t know how Peter Strzok is working there anymore," Trump told Doocy. The report revealed instant messages between unnamed agents, labeled “Agent 1” and “Agent 5,” discussing their jobs in August 2016. “I find anyone who enjoys [this job] an absolute f---ing idiot. If you don’t think so, ask them one more question. Who are you voting for? I guarantee you it will be Donald Drumpf,” Agent 1 sent. “I’m trying to think of a ‘would I rather’ instead of spending time with those people,” Agent 5 sent. The report did not, however, find evidence connecting those political opinions held by FBI officials to decisions made in the Clinton investigation. In a statement to Fox News, Strzok’s attorney Aitan Goelman defended Strzok’s work at the FBI.